The Kent County Chapter of ASD meets on the last Tuesday of every month. Meetings begin at 6:00 pm at the Dover Public Library. Guest speakers present papers and information on topics related to archaeology and history. Open Question and Answer session follows. We then close with a brief report of ASD current events and activities. The public is welcome. New membership is encouraged. Members receive The Bulletin, a yearly publication, and Inksherds, the quarterly ASD newsletter, along with information about upcoming regional archaeology events and learning opportunities. Archaeology may be defined as “disassembling the ground in a meaningful way”. Therefore, we- the Kent County Chapter of the Archaeological Society of Delaware- seek not only to dig, but also to understand the past. To accomplish this, we will strive to do our research responsibly, to record and report our data diligently, and then- having become as informed and educated as we can be – to interpret our discoveries intelligently, and so hopefullly preserve something of our shared local history (and pre-history) for posterity. 1. Create local opportunities for volunteers. 2. Motivate and train volunteers to support the pros in the work. 3. 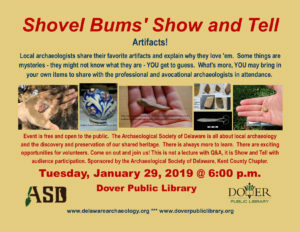 Educate the public in Delaware archaeology and historical preservation. That’s our mission, our vision, and our niche. For More Information, email the chapter president.